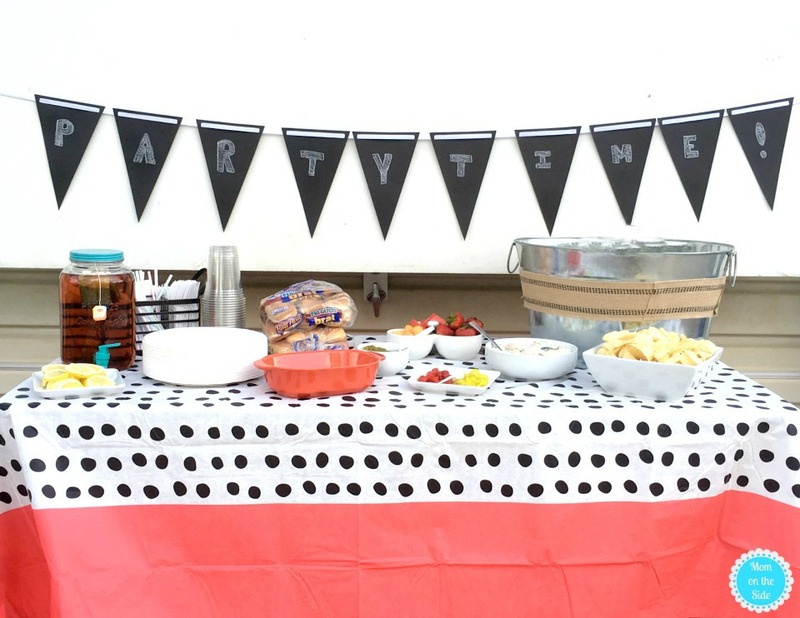 This post on how I host deliciously easy cookouts with friends is sponsored by Hillshire Farm, Lipton Iced Tea, and Ball Park. Any tips and opinions are 100% my own. I am so excited that it’s cookout weather here in Iowa! Yes, people do grill in the snow but I’m a girl that likes lawn chairs, flip-flops, and sunshine. Another thing I love is getting together with my friends, hanging outdoors enjoys sausage and iced tea. My happiness cup was filled recently when I got to do just that. Hosting people for get-togethers is something I really enjoy. I’ve gotten a lot better at the planning and prepping part over the years and today I’m sharing my tips on how I host deliciously easy cookouts with friends. I like to keep my cookouts small. Not only does it make food manageable but it also makes visiting with all the guests easier. 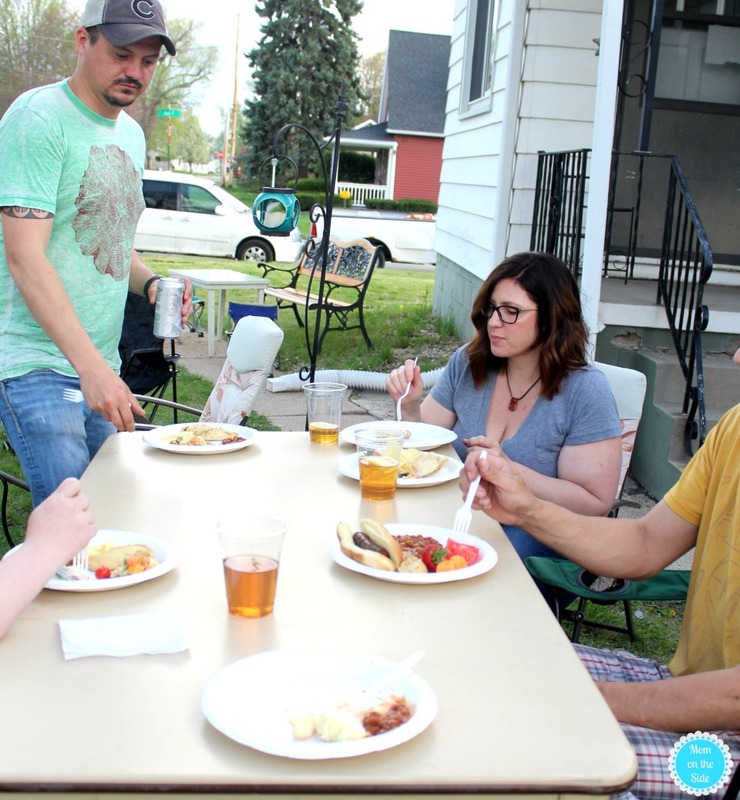 Our most recent cookout was 6 adults and 5 kids and we all had a great time chatting, playing, and eating. At this number, everyone can sit around one table to eat and then gather their lawn chairs in a circle to chat or around the fire when the sun goes down. After hosting many cookouts over the years I’ve learned the easier the food is the better time you’ll have during the party. I don’t want to spend all day preparing side dishes and cleaning up a messy kitchen. My husband doesn’t want to stand at the grill the whole time making sure there is enough food. 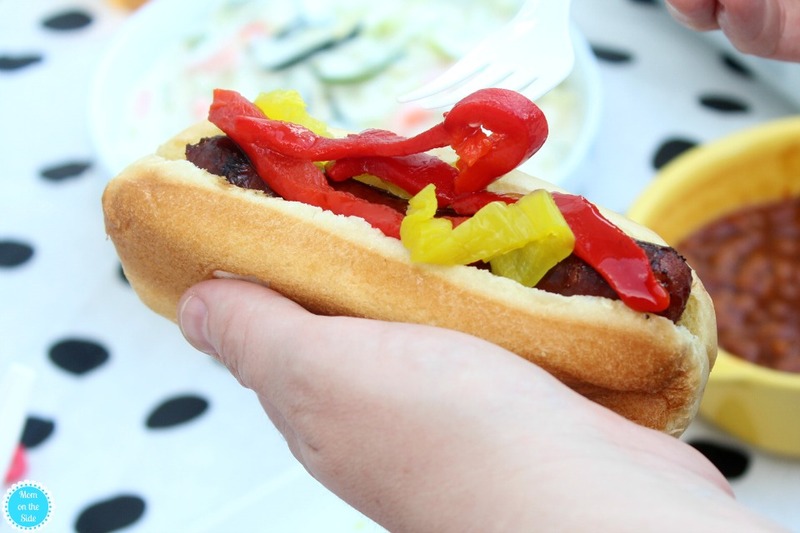 With pre-made side dishes, chips, and cut-up fruit I can focus on the main course, which is brats most of the time because hello easy and yummy. 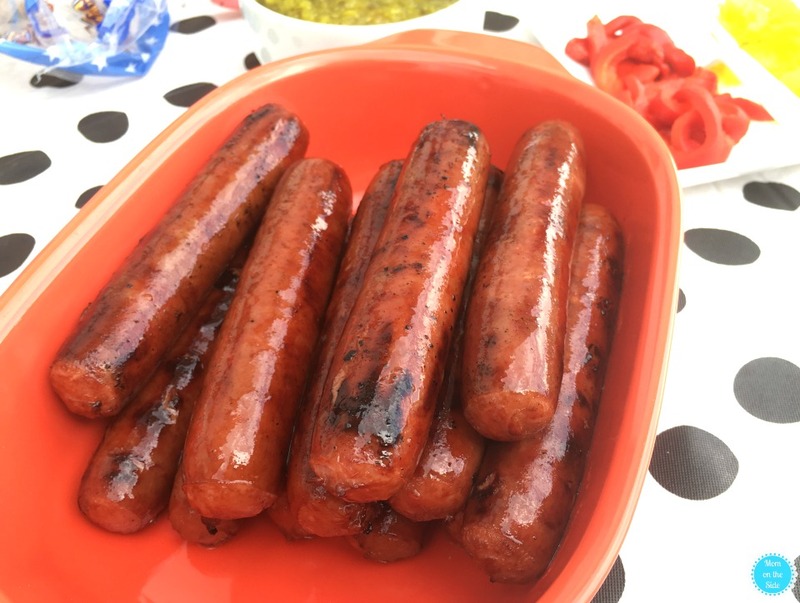 My husband can fit a lot of Hillshire Farm Beef Smoked Sausage on the grill at once and I pick up the 4 pack at Sam’s Club he uses up all the space. The perfect amount for cookouts with friends and serving them means all the food is done at once and everyone can sit down together. Topping bars are one of my go-to’s for cookouts. From ice cream toppings to burger toppings, to salad toppings and the pepper bar for topping the Hillshire Farm Beef Smoked Sausage and Ball Park Tailgaters Brat Buns that I served last weekend. It got positive reviews so I highly suggest trying some peppers on your sausage next time! 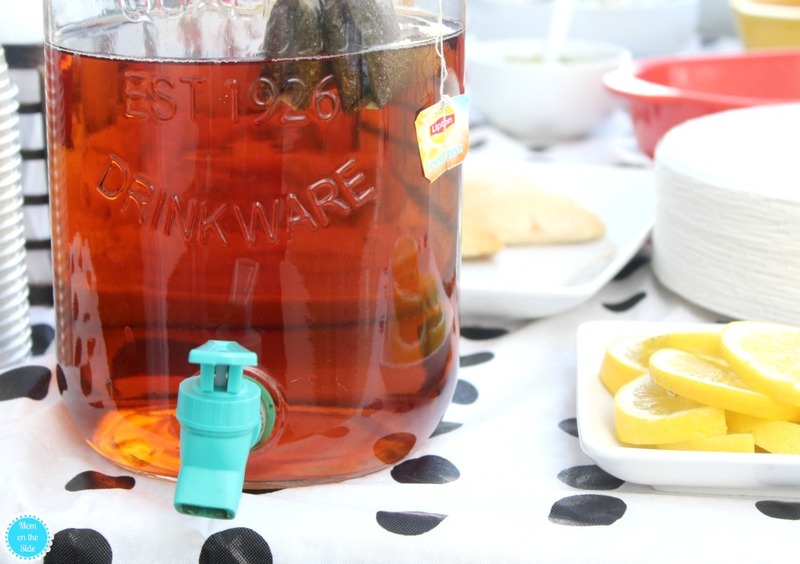 Spring and summer mean iced tea in my house and an easy beverage for entertaining. If you are coming over there will always be a glass waiting for you. Most of the time there are sliced lemons as well. How do you like your tea? Since childhood, it’s been Lipton Iced Tea for me. My mom always had a jug of it, and it’s a staple in my home as well as my sister’s. Check out even more recipes to help you start planning your next cookout and stop by Sam’s Club to save on bulk shopping that makes hosting parties easier! LOOKS like you’re you all had fun. That bike helmet is seriously cute. My mom raised me on Lipton Iced Tea too. Whenever we want to a restaurant her first question was “is your tea fresh brewed?” Followed by “is it Lipton” give her tea that came out of a soda machine and you better get out of her way! She would NOT be happy!